At the very beginning of the year there was a run of long movies, Lincoln clocked in at two hours and thirty minutes, Zero Dark Thirty was seven minutes longer than that and Django Unchained stretched on for a very indulgent two hours forty five. I could have flown from one end of the country to the other and then back again in that time and still had time to browse the books in the Edinburgh Airport branch of WHSmith. It is October now and the summer of superheroes and spaceships is coming to an end once more so we can expect to be putting in the hours again. Awards season is coming and lots of prolific film makers will be hoping to pick up something shiny before the end of February. If you are intending to catch The Butler, The Hunger Games: Catching Fire, Palme D’or winning Blue Is The Warmest Colour and Saving Mr. Banks before the end of the year then that right there is ten hours that you won’t be spending on your Christmas Shopping. First off though we have Captain Phillips which runs for two and a quarter hours itself. Still if those other films are half as gripping as this one it will not matter a jot how long they keep us in our seats for. I have not been as deeply immersed in a film since I don’t know when (of course I know when, it was Black Swan twenty two months ago). You know the kitchen scene in Jurassic Park, where the kids are being stalked by the velociraptors? Do you remember how tense you were the first time you saw it? Do you remember how you could barely breathe? Well, Captain Phillips is like that for 120 minutes. Even the calm bits at the beginning are stressful because you know what’s coming. It is like watching The Impossible where you cannot enjoy the nice scenes of a family enjoying Christmas because you know there is a tsunami on the way. Well, this movie gives you another reason to stay away from the water, it is all well and good seeing our protagonist being kissed goodbye by his wife before he boards the boat but you know sooner or later that same face is going to have a machine gun waved in it. Captain Phillips tells the true story of the first American cargo ship to be taken by Somali pirates and it is absolutely superb. The success of this film is largely down to two brilliant men, the first one being director Paul Greengrass who gave us United 93. Note that I’m not talking about the Paul Greengrass who gave us those two Bourne movies, he’s not quite the same guy. With United 93 and now this, Greengrass demonstrates what he is properly capable of. Good as the movies with an amnesiac Matt Damon are they do not compare to these other films, films that tell incredible stories of real people in real situations. They pay full reverence to the personalities and the politics involved while still showing everyone else in the film industry exactly how a thriller should be made. What you see on screen is Hollywoodised but only just to a point that is respectful. Hold this up against Pearl Harbour which was so gung ho it was ridiculous or the aforementioned Zero Dark Thirty which was necessarily sensitive of sensationalising the events it depicted. Kathryn Bigelow’s film was compelling and tense but was a little muted. Captain Phillips, on the other hand, fully utilises the drama of what these people went through and is the better film for it. This is not an easy balance but Greengrass knows just how far he can exaggerate events without compromising anyone’s integrity. Although, having said that there is one part of the story that I assumed had exercised a generous amount of artistic license but it turns out that is really how it is reported to have happened. I can’t really say anymore than that but if you have seen the film then I am talking about that bit right at the end. You know, THAT BIT, IN THE SUB, AT THE END! Great as Tom and Paul are though this should not overshadow the efforts of everyone else involved. This film would not float without the other people on board. Most notable among the rest of the cast are the four young actors playing the pirates. Barkhad Abdi is getting a lot of column inches for his portrayal of the ringleader and deservedly so but Barkhad Abdirahman is equally impressive, simmering with rage and threatening to explode into violence any minute. Sorry Johnny Depp, but yours is no longer the most memorable screen buccaneer. 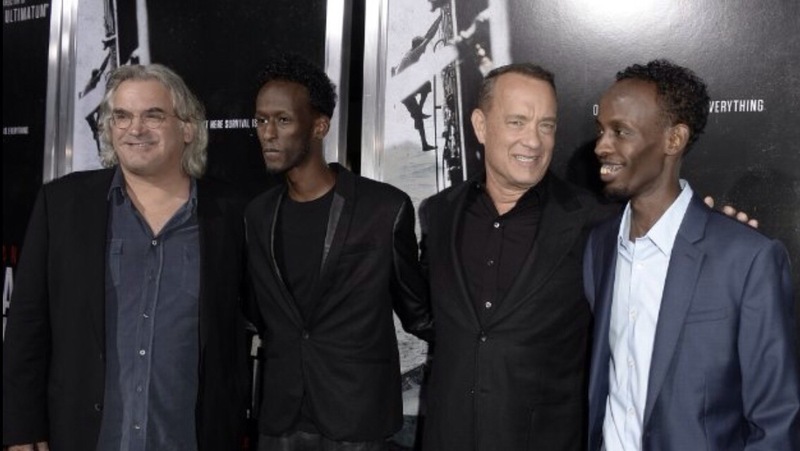 Captain Phillips is a fantastic example of two magnificent film makers working at the top of their game. It is a totally gripping film that tells an incredible story of ordinary people and what they can do in extraordinarily frightening circumstances and that goes for the good guys and the ‘bad’. While there is an intense sense of threat throughout the entire film it isn’t overly violent and there is no swearing so it doesn’t tick any of the boxes for a high rating. It is rated a 12A but just because there is nothing to alarm that doesn’t mean it isn’t distressing. Certainly I came away very slightly shell shocked and I certainly won’t be captaining any transportation ships in the African shipping lanes. Not now, not after seeing this. I got a cinema voucher for my birthday. This may well be what we go for. You won’t regret it although Philomena and Thor 2 are out there as well now. So many films, so little time.